Tahoe, the snowy owl, got his moniker with a bang, one so strong it caught him in the vehicle for which he’s been dubbed. Salthaven West, a Regina wildlife rehabilitation centre, often responds to reports of injured animals, but Thursday night’s call was different from the norm, according to director Megan Lawrence. 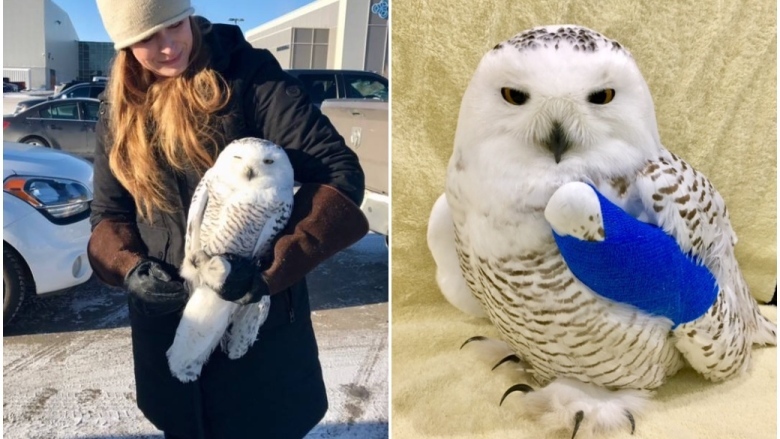 “It’s definitely common that owls and other wildlife get hit by vehicles, but this is the first time we’ve ever attended where one’s still been stuck inside the vehicle after being hit,” she said. A driver was travelling south of Regina along the highway when she saw the owl fly into her SUV, and assumed the worst for the bird. After driving a few minutes into the city, she stopped to see if there was damage to the truck. What she discovered instead was the bright white plumage of a snowy owl, caught within the grille of her Tahoe. She immediately called for assistance, with a local conservation officer contacting Lawrence to respond. With Thursday’s temperatures dipping to as low as –30 C, Lawrence staged a frigid, but fast-acting rescue. Owls can typically be quite aggressive, but with the owl putting up little fight, Lawrence could tell he was badly injured. She performed a brief triage before getting him to the Animal Clinic of Regina, where it was confirmed his wing was fractured. Of concern, however, was the severe head trauma he sustained, with a concussion making his recovery touch-and-go. Fortunately, things seem to be looking up. The young male, whom they’ve been calling Tahoe, is in for at least a six-week minimum recovery period while his bone heals and stabilizes. Before being released, he will be given test flights to ensure he is strong, healthy and not suffering permanent vision damage as a result of concussion. But Lawrence says she’s cautiously optimistic Tahoe will make a full recovery.